Posted by OromianEconomist in Afaan Oromoo, BBC Afaan Oromoo. BBC World Service is an international multimedia broadcaster, part of BBC News, delivering a wide range of language and regional services and working increasingly with other parts of BBC News to serve global audiences. It uses multiple platforms to reach its weekly audience of 320 million globally, including TV, digital platforms including social media, AM, FM, shortwave, digital satellite and cable channels. As part of an historic and exciting expansion the BBC World Service is expanding its language services serving audiences in 12 new languages. All Language Services are multiplatform, with a multimedia website with a focus on digital video, text, interactivity for both desktop and mobile platforms, and a daily TV news programmes for each service. 1. To research, interview original sources and write reports, analysis and features for the BBC Afaan Oromo website in a range of formats. 2. To help produce and/or present the BBC’s live radio programme. 3. To respond to breaking stories whilst on air and to resolve technical difficulties. 4. To create content to drive the BBC Facebook page and other social media platforms. 5. To be able to conduct interviews in audio and video on request, on phone or face-to-face, with authority and in-depth knowledge about the region. 6. To ensure that all output material for which the post holder is responsible meets the standards required by the BBC. 7. To use journalistic skills and experience to suggest new angles on existing stories, means of moving the story on, and to put forward stories not yet covered. 8. To use editorial skills as appropriate to edit, write and adapt the material for the outputs on Facebook and other relevant platforms as required whilst maintaining professional journalistic standards of accuracy, impartiality and fair dealing and adhering to the BBC’s Producers guidelines. 10. To ensure that BBC Editorial principles of balance and impartiality and all relevant legal, contractual and copyright requirements are met, referring upwards in cases of difficulty or doubt. 11. To build and maintain links with other areas of the BBC, including BBC World Service Online and BBC News, to enable the efficient production of content. 1. A full command and up to date knowledge of written and spoken Afaan Oromo. 2. A good knowledge of English, including complete comprehension of written and spoken English and the ability to communicate effectively. 3. Wide and up to date familiarity with the target area and an in-depth understanding of its history, politics, social issues and culture as well as the changing needs of the audience. 4. Recent and relevant experience as a journalist and/or reporter would be preferable but not essential. 5. Ability to write, adapt and translate with accuracy, clarity and style appropriate to differing audiences and forms of social media. 6. A good broadcasting voice and the ability to acquire an appropriate presentation. 7. Able to demonstrate a good range of contacts for interview purposes from all walks of life. 8. Good keyboard/computer skills and the ability to acquire technical skills and to operate technical equipment. Practical experience and extensive knowledge of the Internet and an understanding of the potential of new technology is essential. 9. A thorough knowledge and understanding of news and current affairs in the target area as well as a good knowledge of and interest in, international and regional affairs. Grade: Local Terms and Conditions Apply. Posted by OromianEconomist in BBC Afaan Oromoo. BBC Afaan Oromo aims to deliver our journalism in a lively and engaging fashion, with a focus on interactivity and the promotion of content on social media. 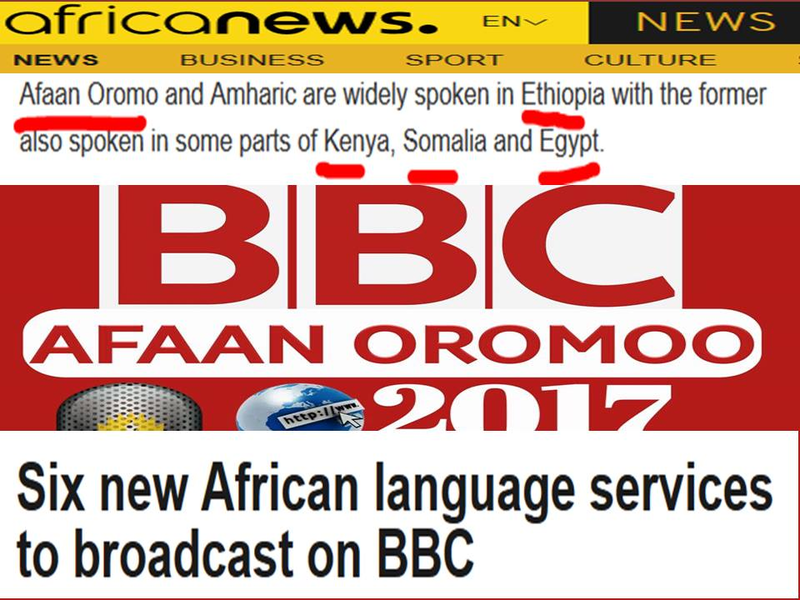 It is via social media that BBC Afaan Oromo seeks to engage younger and digitally savvy audiences. We are looking for a creative and versatile journalist, with a strong understanding of what makes good digital video and how video is consumed on digital platforms. We need a journalist who is passionate about digital video storytelling and is nimble with technology. You will need sound editorial judgment, a good understanding of Africa’s news agenda especially the Horn of Africa region. You will be able to tell complex stories in an engaging way. You will have sharp editing skills and the ability to respond to breaking news. This is an exciting opportunity to lead the digital video effort producing content that works for all digital platforms. Click through on the PDF below to see a full copy of the Job description.